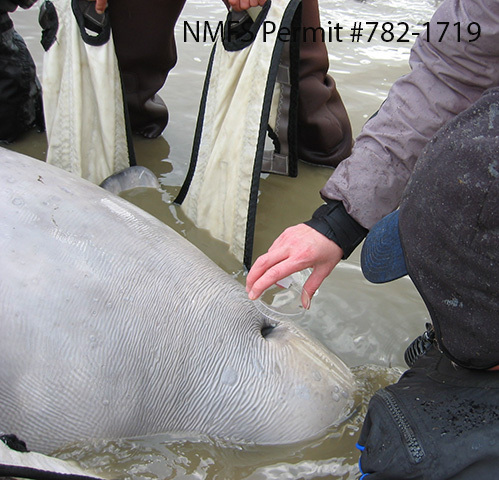 Beluga researchers with a captured beluga use an ultrasound device to measure blubber depth for body condition, before releasing it back to the waters of Bristol Bay. Courtesy Lori Quakenbush, Arctic Marine Mammal Program, NMFS Permit #14245. About 2,000 beluga whales call the salmon-rich, mud-dark waters of Bristol Bay home. This genetically distinct population, known as the Bristol Bay stock, is providing insights into the nature of the small white whales: how they communicate and find food in their noisy, dynamic environment, and how these highly social animals interact. Lori Quakenbush, a marine mammal biologist with the Alaska Department of Fish and Game, has worked with researchers across North America catch and study Bristol Bay belugas. 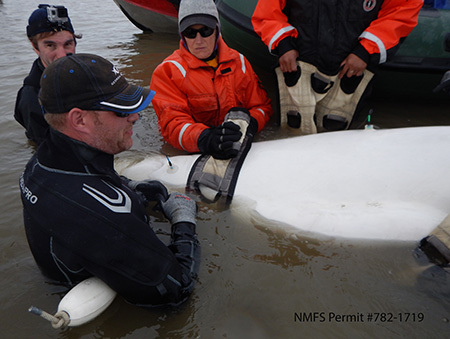 Working with Native Alaskans, who have capture skills and a long subsistence tradition harvesting belugas, she has caught and released more than 65 belugas over the past 16 years in a variety of collaborative research projects. More than 50 of those whales she captured with the same beluga hunter, Ben Tinker, from Aleknagik. Cook Inlet is home to another genetically distinct beluga population, but that stock has declined over the past decades from about 1,000 animals to about 330, and despite protection measures, is not recovering. Cook Inlet beluga whales were federally listed as endangered in 2008. 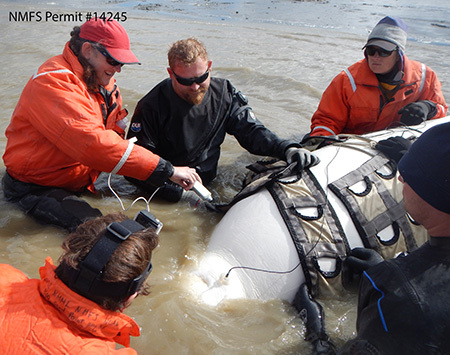 The state of Alaska and the federal government have a beluga recovery team monitoring and researching the Cook Inlet belugas. Belugas range across arctic and subarctic waters and there are at least 19 populations worldwide. There are five populations in Alaska waters, named for the areas where they spend their summers: Cook Inlet, Bristol Bay, Eastern Bering Sea, Eastern Chukchi Sea, and Beaufort Sea. All Alaska populations, except Cook Inlet, winter in the Bering Sea. While some belugas leave their namesake areas seasonally, the Bristol Bay stock lives in Bristol Bay year-round. Belugas in Bristol Bay are harvested by Alaska Natives, and estimates of population abundance and trend are important to insure the harvest is sustainable. The population abundance of 1,928 belugas (not including calves) was reported in a recently published study using genetic mark-recapture methods. For this study, only a skin sample was captured, not a whole beluga. Quakenbush, and Fish and Game biologists John Citta and Anna Bryan, working with Alaska Native hunters and a geneticist from the Harbor Branch Oceanographic Institute with funding from the Alaska Beluga Whale Committee, identified 516 individual belugas between 2002 and 2011, using genetic material derived from skin samples, and subsequently “recaptured” 75 belugas and applied a mathematical model to estimate the abundance. Biologists collected the samples using a biopsy pole, a pole about six feet long equipped with a special hollow tip, while Alaska Native beluga hunters maneuvered the boat close to the whales. The biopsy tips are also threaded onto crossbow arrows and used to collect samples from walruses, but the pole works better for belugas. The pole is thrown, or the beluga can be jabbed. 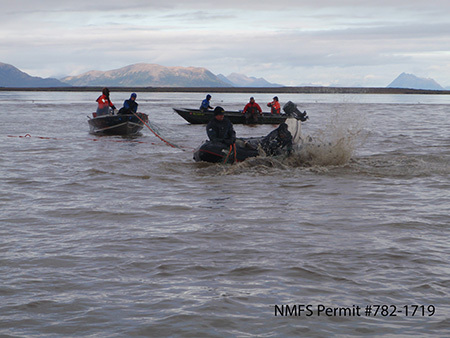 Samples were collected in the spring immediately following break up, when river ice washes into Bristol Bay and belugas travel up rivers to feed on rainbow smelt and out-migrating salmon smolt. A driver in an open skiff, with the “beluga sampler” in the bow with the biopsy pole, located belugas in the river and moved in close. The pole was tied to the boat with a light line so it could be thrown at the animals and quickly retrieved with the sample. The hollow biopsy tip cut and grabbed a bit of skin the size of a pencil eraser from the back of the beluga, tailward of the flippers. Aerial surveys have been used to estimate beluga numbers in Bristol Bay, but it is difficult to see all the animals in the silty waters. Biologists apply a “correction factor” to account for the animals that are present but not seen underwater. Data from belugas equipped with VHF transmitters, and more recently, with satellite transmitters, helped biologists develop the correction factors. Quakenbush said the genetic mark-recapture study helped biologists fine tune the aerial survey calculations by providing an estimate from a method completely independent of aerial surveys. “We can compare the two methods and see how close we were getting with the correction factors we were using,” she said. A genetic sample enables a biologist to identify an individual animal, its gender, and its relatedness to others. Comparing genetic samples from two individuals can reveal if the two animals are closely related such as siblings, sharing one or both parents, or parent and offspring, or not closely related. As a result, beluga genetics is also helping biologists better understand the animals’ social structure and kinship. The dominant pair in a pack of wolves might produce a litter of seven pups every spring. An adult female beluga has just has one calf at a time, and only once every two or three years. Genetics can show if a particular male is fathering many offspring, or if another breeding strategy is at work. Quakenbush said that like killer whales and dolphins, belugas are very social animals. Belugas frequently forage together, often in groups and within the groups there are adult animals that stick together. Biologists would like to learn more about the relationship between these belugas. When belugas are captured, their holding time is brief, and they can quickly reunite with their groups. Biologists and their colleagues, the Native Alaska hunters, locate belugas in shallow water close to shore. Working from open skiffs, they watch the animals and avoid calves and cow-calf pairs. Belugas between eight-and-a-half feet and up to 13-feet long have been captured, but Quakenbush said with every foot in length they gain a lot of mass – their girth increases and they are much heavier. And bigger animals are much harder to work with. A variety of things may happen, depending on the research project, but blood and tissue samples are always taken and most belugas were tagged with satellite transmitters. The samples are shared with different beluga research projects across the country; biologists are looking at things like blood chemistry, genetics, and hormones. In many cases, this variety of research contributes to fund the captures. Now Georgia Aquarium, Shedd Aquarium in Chicago, and Mystic Aquarium in Connecticut are providing significant support for many of these studies The Alaska SeaLife Center has been the major coordinator of the captures and sampling in recent years. Bristol Bay has the largest sockeye salmon fishery in the world, an average of 37.3 million sockeye salmon were commercially harvested every year between 1992 and 2011. Belugas are a primary salmon predator, and it’s important to understand the relationship and interactions of the two species. 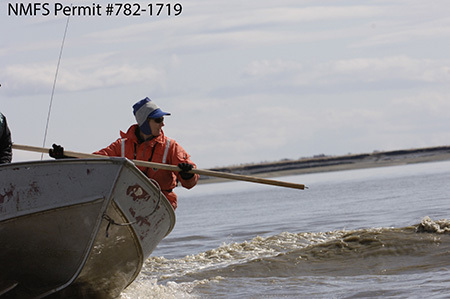 Between 2002 and 2011, 31 satellite transmitters were provided by National Marine Fisheries Service and the Alaska Beluga Whale Committee, the Alaska Native co-management group, to track the movement and distribution of belugas in Bristol Bay. Because Bristol Bay salmon are extensively studied, biologists linked the seasonal movements of belugas to salmon. Another recent study investigated beluga hearing, and measured sound and background noise in Bristol Bay. The bay’s dynamic tides move sediments, water and ice, and create a lot of noise underwater. How do you measure a wild beluga’s hearing? Researchers use three electrodes, one placed near the blowhole, the other two along the back. Suction cups hold the electrodes in place. The electrodes measure electrical impulses generated in the brain when sound is detected. This method was initially developed to measure hearing in infants and babies. A toothed whale (odontocete) hears through its jaw, picking up sound pressure waves moving through the water just as we detect sound pressure waves moving through the air with our ears. A small device is placed underwater on the whale’s jaw to generate a range of frequencies at a specific sound level, bracketing what is too “low” to hear and too “high” to hear. The sound levels are consistent in all the tests, although time constraints limited how many frequencies in between the high and low could be tested in any given capture. Humans hear in a range of about 20 to 20,000 hertz (Hz), although most adults over about 45 lose the upper end of that range and it drops to about 15,000 Hz. (For context, a piano has a range of 27 hertz to about 4,100 Hz, and our hearing is most sensitive in the typical range of the human voice, 60 to 4,000 Hz). Researchers tested 26 belugas, creating an audiogram as a graphic representation. The goal was to establish the baseline population audiogram, note incidences of hearing loss and general variability in wild beluga whales. Beluga hearing is sensitive, and ranged from 16 Hz to 100,000 Hz, well past the upper human range, and most responded to sound up to 120,000 Hz. Environmental sound was detected, recorded and measured using hydrophones attached to both moored and drifting buoys. The bay was noisiest during ebb tides; with considerable underwater noise generated by moving sediment extending up to 60,000 Hz. Understanding the natural noise levels and ranges in the environment provides a context for how the belugas use their hearing and at what level man-made noise may mask what belugas need to hear to travel and forage. Bristol Bay belugas are providing other insights into beluga health and physiology: biologists are using ultrasound devices (like those to monitor fetal development in people) as a non-invasive way to measure beluga blubber stores, which offers clues to body condition, nutritional status and health. Over time, work on the many samples collected, analysis of the data gathered and further research will greatly enhance our knowledge of beluga whales.